Dear Genie Rainbow Dash I was wondering given that she admires you from afar: Did Scootaloo ever made a wish that you had to grant ? If Rainbow Dash is a Genie, then that mean she can grant Wishes like wishing that Scootaloo can finally fly, right ? Why does Scootaloo just wish that Rainbow Dash was her sister ? 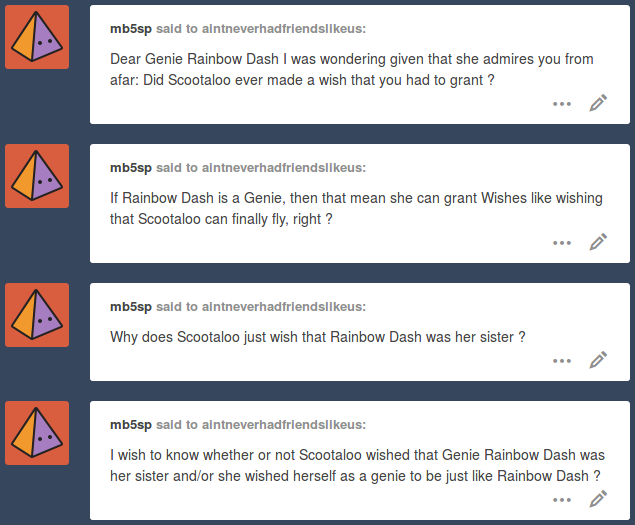 I wish to know whether or not Scootaloo wished that Genie Rainbow Dash was her sister and/or she wished herself as a genie to be just like Rainbow Dash ? Genie Rainbow: I was of course referring to this incident. Although I didn’t mention geniefication above, I’d refuse that as well from Scootaloo since she could easily give herself flight and sisterhood afterwards. Genie Rarity: In other news, funding is going on for a new blogging/media website called WritScrib, which many ponies have already fell in love with. If you’ve got spare money, please donate it at the link in this paragraph.